Being in business can be tough. From getting and keeping customers to maintaining competitive prices and great customer service, even the best of businesses need help sometimes. Whether you’ve got a small shop along the shoreline in Melbourne, Florida or a large business in a multi-level building, we know the last thing you want to worry about is plumbing issues. That’s why you need to have a master plumber on your list of who to call in an emergency. The difference between a licensed master plumber and a regular licensed plumber is great. Not only does a master plumber have years of extensive experience, but they are educated and knowledgeable about residential plumbing and commercial plumbing as well. They can work on the job themselves or supervise other licensed plumbers, making sure the job they do is quality work that is up to code. Although it’s unfortunate, many people don’t treat public toilets the same way they would their own. They may not throw trash down their own toilet at home, but when out and about, it can almost seem as if people think a public toilet doubles as a trash can. The last thing your business needs is a clogged toilet that isn’t functioning. While it can help to post signs asking people to watch what they throw down, this doesn’t always work. So when you need emergency help, call a master plumber to get your toilets back up and running, so you can concentrate on more important matters regarding your business. Another cause for concern in a business is busted pipes. Water damage can be costly – from damaged goods to ruined files in cabinets, it’s so important to get the problem resolved as soon as possible. So, getting a qualified master plumber who understands pipes is necessary, and the sooner the better. 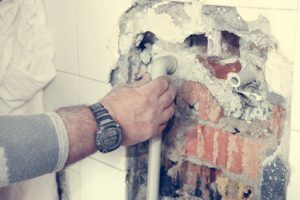 If you don’t have a plumber on your emergency phone list, you should consider calling and talking to a master plumber in Melbourne, Florida who can help you when you need it most. After the toilets are clogged or a pipe has burst is not the best time to be looking for someone who can help you quickly. You need to be able to dial and dial quickly to get someone out to your establishment fast, and prevent any further damage. Consider putting a master plumber on your emergency list so you can rest assured that you’ll get experienced, expert help when you need it most.